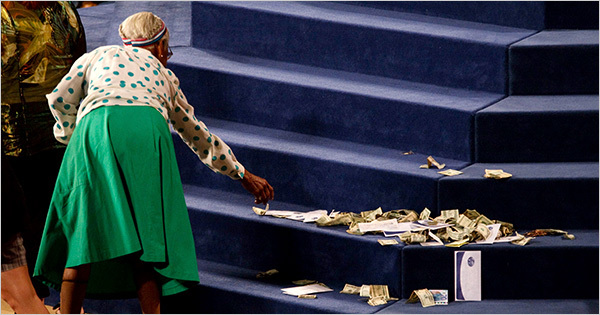 It seems the global financial crisis has only encouraged the spread of the "prosperity gospel." It is certainly a distortion of the Christian message if it is primarily interpreted as a program for the material improvement of the human condition. Berger applies the same argument all materialistic distortions of the Gospel. It is useful to point out that the materialist distortion of the Christian message is fully shared by the liberation theology of the anti-capitalist left. Only here the material improvement is understood in collective rather than individual terms: put your coin in the collection plate of the revolutionary movement, and the soul of the masses will be freed from the purgatory of capitalist exploitation. Any reinterpretation of Christianity in terms of a this-worldly agenda, individual or collective, is a distortion. Older PostIs the gospel good news for the poor?